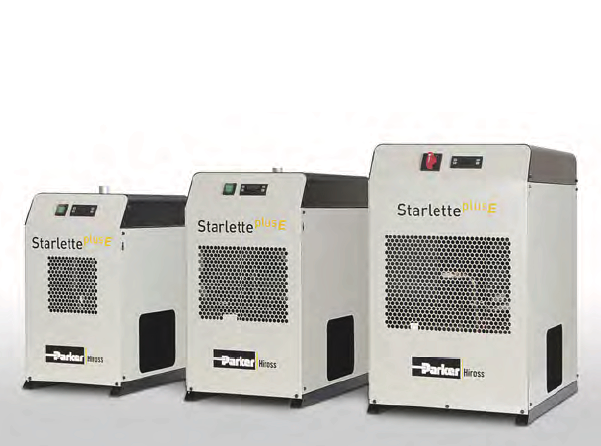 The Parker Hiross StarlettePlus-E series of refrigerated dryers (SPE) is the perfect solution for efficient removal of water vapour from compressed air and combines quality and efficiency in a reliable design with the smallest impact on the environment and on the operating costs. Developed around a state-of-the-art Aluminium heat exchanger (E-Pack), with a patent pending all-in-one design, featuring an air-to-air section, an airto- refrigerant section, a highly efficient stainless steel demister separator and a moisture collection chamber, the new StarlettePlus-E series provides air quality with unrivalled running costs. Thanks to the highly efficient E-Pack design, the refrigerant circuit absorbs lower power and uses less refrigerant charges than other comparable dryer, making StarlettePlus-E the range in the market with the lowest running costs and the smallest impact on the environment. All models are equipped as standard with a digital controller that provides features useful in the day-by-day operations of any application: dew point level indication, free voltage alarm contact, maintenance reminder and integral timed drain control. In addition, thanks to its dual frequency design, StarlettePlus-E is ready to operate either in 50Hz or 60Hz environments. Reference conditions in accordance with DIN ISO 7183: air flow based on FAD 20 °C / 1 bar A, 7 barg working pressure, 25 °C cooling air temperature, 35 °C air inlet temperature and +3°C pressure dewpoint. All models supplied with refrigerant R134a.